Monetizing What You Love Doing: For the last few days I have been writing a little about the Gladiator Fire which threatens the little community where my wife and I live. Fires are categorized into types with a Type 1 incident being the most serious and so garnering the most resources (financial and man-power). The Gladiator Fire is a Type 1 incident and there are a lot of people doing all sorts work that most people would never even think of. Walker (where we live) is the the big "value at risk" and so we are a center of attention of sorts for the incident and I have been very engaged in several aspects of the fire which has allowed me to learn a lot about how these types of incidents are managed. I've also gotten to know quite a few people who might be involved should we ever have one of these closer to home. In the past I've made vague references to doing certain types of tasks on these incidents as a post retirement income income stream. For example large incidents have a finance division which lends itself to people with flexible enough schedules to take the occasional, seasonal gig. I have a more tangible example of this. Last night on my way into the planning meeting I ran into a (retired) friend I've known through fire service for many years now and he was working for the fire in a similar capacity as one of the finance jobs. My friend had to go through some serious paperwork hoops but he contracts on a per incident basis to shuttle supplies from the camp around the Incident Command Post (ICP) to various points out on the fire (from top to bottom the fire is about six miles long, the base camp is about 20 miles from the anchor of the fire appears to be 22 miles around). He uses his truck so there is serious wear and tear on the vehicle. The pay is a little over $300 per day plus mileage and he can eat the food provided at the fire camp (that might seem like a joke but assuming the food is good, and it is, that is one less expense as he goes). He said the mileage about covers the fuel expense for his vehicle. The trade off is the wear and tear on his truck and driving all day, every day for what will probably be 14 days (more on that in a moment) so this is not easy work. The upside to the work is any involvement with a big fire--people who do this stuff love it and often want to stay involved in some capacity for as long as possible. He can be called to any type of incident anywhere but realistically there might be 3-5 times a year that he will work a fire in this capacity. People on the fire in typical roles (firefighters, members of the incident management team and so on) have a 14 day time limit but I don't know if that applies to someone in my friend's capacity or not. Assuming it does he'll make a little over $4200 and if he does that four times this year then it is almost $17,000. In terms of monetizing a hobby or finding a unique solution tailored to your own situation and interests this example epitomizes exactly what I had in mind. There won't be too many people who want to do this which of course does not matter; he does, he loves it and the money is meaningful. For someone living a modest lifestyle $17,000 could easily cover three or four months of basic expenses--maybe even a little more? Make no mistake this is hard work he's doing but if you love it, it isn't necessarily "work." 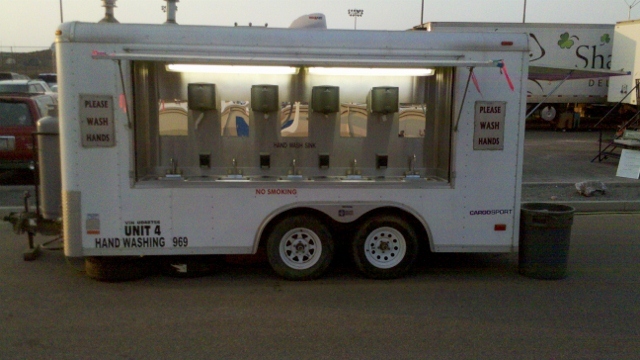 As for the picture, someone is leasing the hand washing station to the fire.